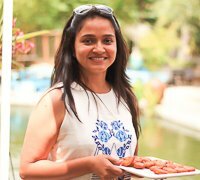 Give this Milagu Keerai Poricha Kootu a try and serve it for a South Indian lunch along with Rice, Rasam and Urulaikizhangu Roast. 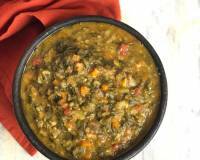 This is an easy recipe, nutritious and a great dish to include in your everyday diet. 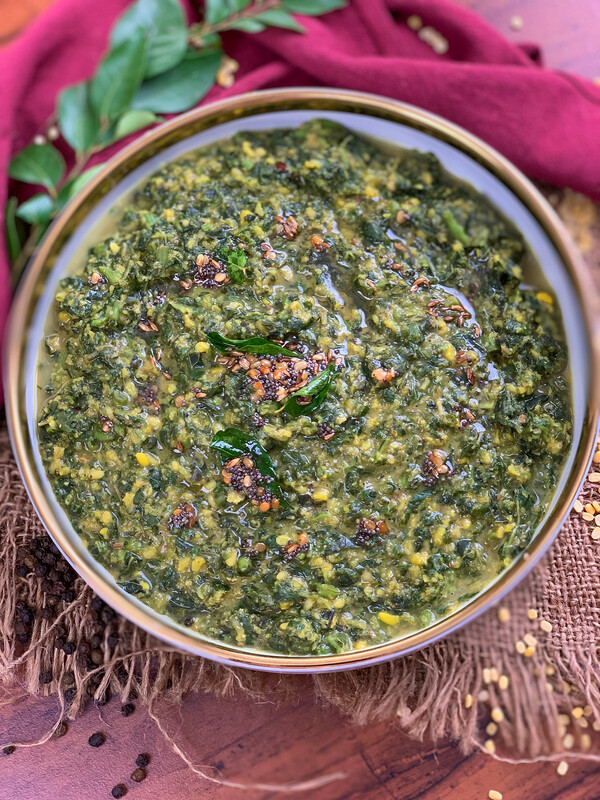 The Milagu Keerai Poricha Kootu Recipe is a wholesome dish from Tamil Nadu which is packed with flavors from the roasted urad dal, black pepper which is ground along with coconut. 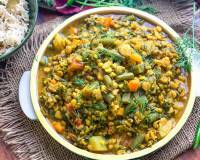 Kootu is essentially a dal and vegetable combination which is coked with some everyday masalas. Did You Know- Spinach is a super food which is packed with a lot of nutrients and most importantly it is low in calories as well. Spinach and green leafy vegetables are important for skin, hair, and bone health.In addition, they come with a lot of other health benefits, for example they improve the blood glucose in people with diabetes, lower the risk of cancer, reduce blood pressure and much more. So go ahead, make this Milagu Keerai Poricha Kootu for your South Indian lunch and serve it along with steamed rice or Brown Rice, Thakkali Rasam Recipe and Urulaikizhangu Roast. 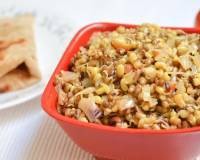 You can also make this for an Indian dinner and keep it simple along with Phulkas and Boondi Raita. 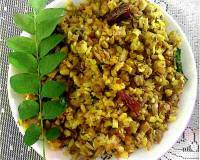 To begin making the Milagu Keerai Poricha Kootu Recipe, firstly prepare all the ingredients and keep them ready. Into a pressure cooker, add the amaranth, a pinch of salt along with 2 tablespoons of water. Cover the cooker and pressure cook for about a whistle and turn off the heat. Place the cooker under running water to release the pressure immediately. This process is important to not over cook the spinach and keep it fresh and green. Open the lid of the cooker and keep aside. The next step is to make the dal. 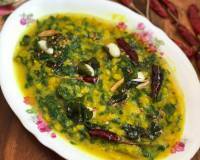 Add the moong dal to the pressure cooker along with, turmeric powder, salt and 2 cups of water, . Cover the cooker and pressure cook the moong dal for 4 whistles and turn off the heat. Allow the pressure to release naturally. Once the pressure gets released, open the cooker and give a stir or a light whisk. Now, we will proceed to roast the masala for the Keerai Poricha Kootu recipe. Into the mixer jar, add the cumin seeds and black pepper corn and the freshly grated coconut. Add 1/4 cup of water and blend to make a coarse paste to make the poricha kootu masala. 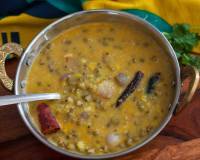 Stir in the cooked keerai/amaranth into the cooked dal. 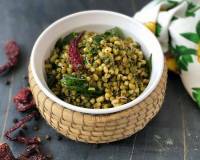 Add this kootu masala into the moong dal and keerai mixture and stir well. Check the salt and adjust taste accordingly and bring to a brisk boil. The final step is to make the tadka or the seasoning. Heat the oil in a pan over medium heat. Add the mustard seeds, cumin seeds and urad dal. Allow them to crackle and the dal to turn golden brown. Finally add the curry leaves and turn off the heat. Add the seasoning mixture to the Keerai Kootu and stir well. Place the Keerai Kootu, which is still in the pressure cooker and give it a brisk boil. You can optionally add a tablespoon of ghee or butter to enhance the taste. Once done, transfer the Milagu Keerai Poricha Kootu to a serving bowl and serve hot. Make this Milagu Keerai Poricha Kootu for your South Indian lunch and serve it along with steamed rice or Brown Rice, Thakkali Rasam Recipe and Urulaikizhangu Roast. 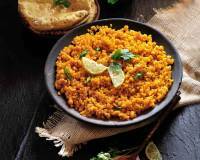 You can also make this for an Indian dinner and keep it simple along with Phulkas and Boondi Raita.